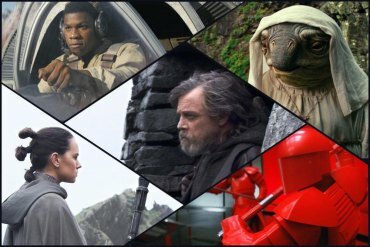 Mixing iconic past moments, continuing adventures with old favorites (Luke Skywalker, Princess Leia, R2D2, Chewbacca, C3P0) and further exploration of personalities introduced in "The Force Awakens" ( Rey, Finn, and Poe), writer/director Rian ("Looper," "Brick," "Brothers Bloom") Johnson catapult the space western into "Empire Strikes Back" territory. Recognizing that George Lucas conceived "Star Wars" from an obsession for Japanese director Akira (Magnificent Seven, Ran) Kurosawa epics, John Ford westerns, science-fiction serials, Johnson instructed his writing staff to watch Twelve O'Clock High, The Bridge on the River Kwai, Gunga Din, Three Outlaw Samurai, Sahara, and Letter Never Sent for inspiration. They captured the trademark of the spacebucklers --- seamlessly invigorating multiple interconnected storylines, "Jedi" swaggers from the Resistance fighters led by General Leia Organa (Carrie Fisher) battling to evade First Order trackers which sends Rey to persuade Luke (Mark Hamill) to come out of self-imposed isolation to revive the Jedi knights. Meanwhile, Kylo (Leia's son, played by Adam Driver) faces rebuke from the Supreme Commander for hesitating to exercise powers of the Dark Side to the fullest, as an inner conscience weighs on his mind. Fanboys (and girls) recall the franchise for lightsabers, battle armored troopers, intricate spaceships, death star weapons, video game styled blitzes and dogfights , and Yogi-esque Force meditations. Those familiarities abound in "The Last Jedi," but the foreshadows of extinction and change send emotive twinges throughout. 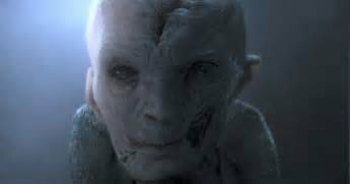 The grayer than Vader villain (Kylo) demands abandoning the past --- forgetting Jedi, the Sith, and Skywalkers. As these familiar "toys" from the 80s fall into rei-imagination just as younger personalities replace those who have literally aged. 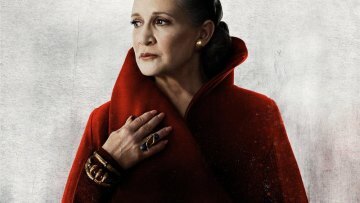 "Last Jedi" has explosive and twisting more of the same elements, preparing audiences for a torch passing that soars past the death of Princess Leia (Carrie Fisher) last year. It's too early to trace viewer reaction --- which seems to be trending unusually below critical responses. My most "hun" moment came when (spoiler alert) Leia survived an explosion and floats through space to a second ship sans spacesuit. She spend part of the film recovering from the ordeal. No other hints from the multiple plotlines from me. Battles, music, personality conflicts, humor, emotion, and special effects equal or exceed past entries including "Empire Strikes Back." Opening with a cliffhanger narration crawl (like the initial entries), the story picks up where "Force Awakens" left off zooming intensely into spectacular starry space for spectacular "there will be no surrender" clashing of force fields and lasers. Director Johnson tosses a few symbolic morsels jettisoning fairy tale "black" and "white" for repeated allusions to realities --- heroes are not necessarily leaders and failures can be the greatest teacher (no one is perfect!). The franchise maintains it's signature "hope" for better --- sparks for the oppressed and downtrodden to keep up their efforts, a hint of love conquers all, and the casino that tips a dark shadow on the military industrial complex where the wealthy sell to both good and bad dudes. 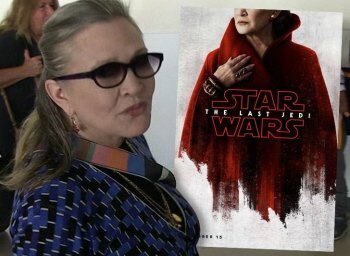 As "Force Awakens" propelled a continuing crusade against authoritarian regimes, "Jedi" like it elevates women's roles to those of males (and interstellar aliens and droids) maintaining equal values for all life forms (which began when Lucas' "Star Wars" premiered in 1983) and ravaging the psychological baggage which cultivates dark sides. Upon exiting, I found no one stating a discouraging word. The next one will be pivotal --- the newer generation of characters will take the lead --- perhaps, in a manner of the "Star Trek" incarnations. Whether the "Force" represents a universal connection, a higher power, or a belief in God, it and droids will be threads for the next chapter.